Bluesound Pulse 2i review | What Hi-Fi? 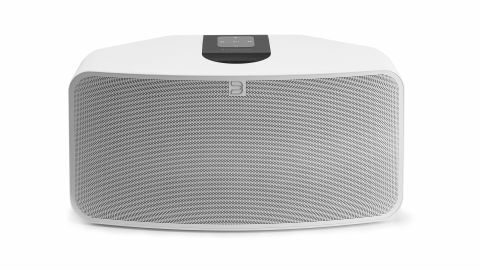 Bluesound is understandably excited about its redesign of the Pulse 2i. But, like a child coerced into chasing its parents’ unfulfilled aspirations, the company’s flagship wireless speaker does not quite match the enthusiasm of its creators. It’s strange that the Pulse 2i was the one component of Bluesound’s multi-room set-up where it decided effectively to tear up the blueprint and start again. The Pulse 2, already the latest of the range’s speakers granted a second-generation makeover, was the only component to retain its five-star status when we pitted the Award-winning multi-room system against renewed competition earlier this year. Elsewhere in the range, comparatively minor tweaks to those products that lost ground – the Node 2 streamer in particular – have brought quite considerable gains. A more cautious approach to updating the Pulse 2 may have shed different light on this latest incarnation. Bluesound’s ambition in creating the Pulse 2i is admirable. Though outwardly it pretty much mirrors its predecessor, beneath the surface it is a different being altogether. The previous driver configuration of two 7cm drivers and single 13cm bass unit has been swapped for a pair of 25mm tweeters and two 13cm bass drivers. At first glance, the spec sheets may look similar – Bluesound’s commitment to hi-res audio, including lossless MQA, is still a major selling point – but the company has upgraded components across the board in an attempt to design the ultimate hi-fi-ready multi-room speaker. The brand new Pulse also supports Alexa Voice Control and Apple AirPlay 2 – in line with all new products on the new Bluesound 3.0 software – alongside two-way Bluetooth that offers the option of using it with wireless headphones as well as through that all-new driver array. The Pulse 2i’s more muscular character makes for a startling first impression. This isn’t a small unit by any stretch, but it belies its physical heft to deliver a weight and scale of sound that easily fills our listening room. It pulls no punches when it comes to dramatic and impressively detailed low end. There is more pronounced detail across the frequency range emitting from this new model, the Pulse 2i making use of its newly installed tweeters for a presentation that is in line with Bluesound’s characteristic body and warmth without dialling out any of the treble. Other wireless speakers offering comparative power, if not quite matching the Pulse 2i’s scale, might stray into being over zealous or harsh, but this unit remains in charge of its might, breeding authority over brutishness. Its downfall, however, feels altogether more human. While the muscle is lean in many areas, there is an overall more sluggish and less expressive nature to this revised version. The Pulse 2i now struggles to organise instrumental strands as its predecessor did, or inject them with the same life that retained its five stars when all else in the range dropped their own. It is evident not only when comparing with rivals such as the Audio Pro Drumfire and Naim Mu-so Qb – though the extra £100 on its price tag makes the Pulse 2i’s task all the more difficult – but even with those products across the rest of the Bluesound range. The Pulse 2i does well to retain the company’s rich tones and levels of insight, but it now feels a little out of place in the family when it comes to timing and dynamics – two areas in which it previously did well. We can’t be too harsh on Bluesound or its top-of-the-range speaker – the choice to strip it entirely and begin again was a bold one that highlights the drive not only for market dominance, but more generally in bettering the performance available from a multi-room speaker. And certainly there are improvements in key areas, but, while the Pulse 2i remains entertaining, it is disappointing to have sacrificed the energy and composure for which we loved its predecessor. Sadly, for this price, you could do quite a bit better in this market.